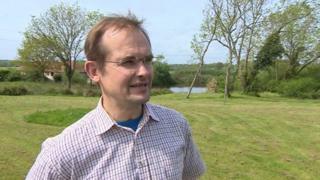 A Sussex farmer has rejected an offer of about £275m for his land from developers seeking to build a new town. Robert Worsley, who has run his 550-acre farm in Twineham for the past 15 years, said he would rather protect the countryside than personally profit. Developer Mayfield Market Towns wants to build 10,000 new homes on land between Sayers Common and Henfield. Director Lee Newlyn said it currently had about 600 acres of land under its control, but needed nearer to 1,000. "We don't rely on any particular one landowner. We can go in several directions in order to complete the new town," he added. The proposed development, across the Horsham and Mid Sussex districts, would also provide community facilities including primary schools, a new academy and shops. Mr Worsley has lived in the area all his life and said for many years he had "bemoaned the fact that we're seeing Sussex land eroded away". "If we increased the population density to the levels that would be implied by settlements of this size, the charm and character would be lost," he said. He maintained that no amount of money would persuade him to sell his land. "I would be guilty of huge hypocrisy if I were to be the beneficiary of just such an action." Protest group Locals Against Mayfield Building Sprawl (LAMBS) have said the scheme is "completely unsustainable", saying the area has no infrastructure, no jobs, is prone to flooding and is miles away from a railway station. The group has the backing of the Conservative MP for Mid Sussex, Sir Nicholas Soames, who is confident it will not succeed under current planning laws. But Mr Newlyn said many people had said homes were needed in the area. "That has to be countered against any local understandable opposition, and what we have said is that all needs to be sorted out through the local plan processes, and that's what we're doing."